2Payame Noor university, Tehran, Iran. 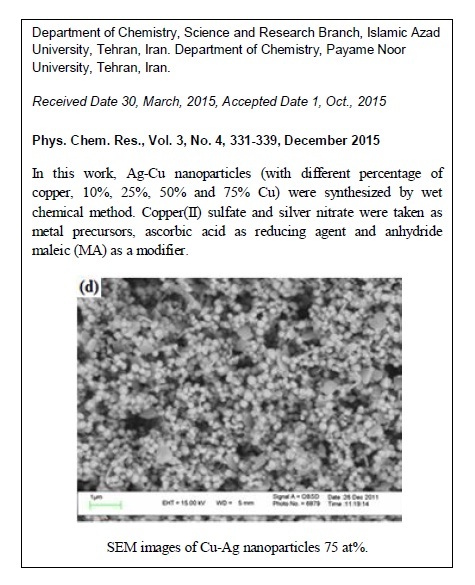 In this work, Ag-Cu nanoparticles (with different percentages of copper, 10%, 25%, 50%, 75% Cu) were synthesized by wet chemical method. Copper(II) sulfate and silver nitrate were taken as metal precursors, ascorbic acid as reducing agent and anhydride maleic (MA) as a modifier. 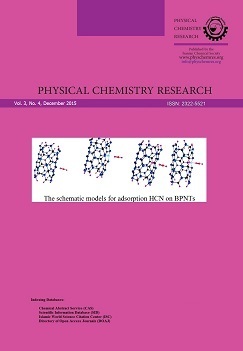 The prepared nanoparticles were characterized by means of X-ray diffraction (XRD) technique and scanning electron microscopy (SEM-EDAX), Fourier transform infrared spectroscopy (FT-IR) and UV-Vis spectroscopy. SEM indicated the formation of uniform spherical crystalline nanoparticle in a well distributed size and morphology. It can be seen from these pictures that the particle size decreased with increasing of the copper percent. When the molar ratio of Cu2+/Ag+ is 75/25 (>50%), mixture of the spherical and hexagonal nanoparticles was prepared. Three pronounced Ag diffraction peaks (111), (200) and (220) appeared at 2θ = 38°, 43.9° and 64.1°, respectively. The three most intense peaks of the XRD pattern of sample showed a slight shifting of the center of the diffraction peaks toward a lower angle. No shifting was observed in XRD lines with the increase of Cu2+ to Ag+ ratio in the Cu2+/Ag+ mixed solution (> 50% Cu). Fourier transform infrared spectroscopy (FT-IR) showed that nanoparticles are coordination between oxygen atoms and nanoparticles, because functional unit C=O present in MA, shifts to 1652.69 cm-1 after embedding nanoparticles. The position of the surface plasmon resonance (SPR) absorption band on the nanoparticles could be shifted from 380-350 nm via the change of their percentage of Cu.